Pulse 9 of the Oreos in a food processor (or blender) until finely groung. Place them in a bowl and set aside. Place the remaining Oreos (36) in the food processor and pulse until finely ground. Add in cream cheese and processor until a dough-like mixture forms. Form the dough into 1/2 inch balls and place on the cookie sheet. Refrigerate until firm, about 1 hour. Heat chocolate in a double boiler until smooth and melted. Remove the truffles from the refrigerator. Using 2 forks, cover each truffle in chocolate and return to the cookie sheet. 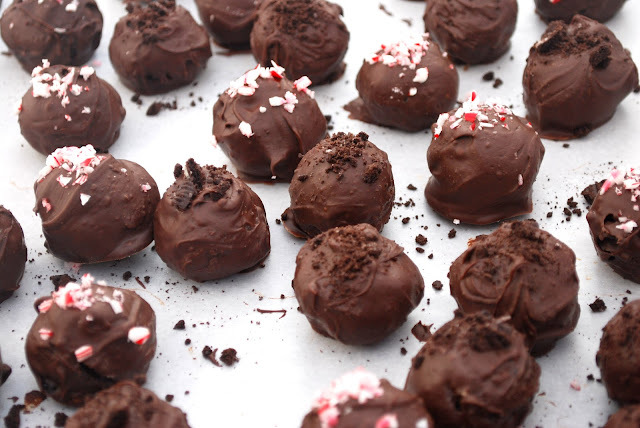 Sprinkle a bit of the reserved cookie crumbs on top of the truffles and return them to the refrigerator. Let the chocolate set for at least 1 hour before serving. Keep remaining truffles covered in the refrigerator.